We are proud to announce that the 2017 Impact Factor has increased to 1.722. In 2017 we have published 126 papers, see also Number of papers accepted by Software Engineering journals in 2017. SoSyM is proud to announce that it has now a systematic track to submit papers "journal first". This initiative enables authors of SoSyM articles that have not been presented elsewhere (not even in shorter form) to reach a broader conference audience. Since 2015 the MODELS conference and SoSyM have established a continuing collaboration to host the presentations of the papers that have been submitted as journal-first papers at the conference. We assume that this is a synergetic situation for both, as it enriches the conference program with works that may not fit the standard conference format and process, and on the other hand, may draw more attention to SoSyM. In order to improve SoSyM by addressing community needs, we asked readers and authors to suggest the topics and themes that they would like to see in future issues. Several responses suggested the need for survey/overview articles that address specific areas of software and systems modeling. Therefore, we encourage the submission of survey articles that are of excellent quality (e.g., a systematic literature review of a SoSyM topic area, or a deep overview of a specific area that summarizes past work and synthesizes a future research plan while also identifying open problems). If you have an idea for a survey paper about a modeling theme, please consider submitting a scientific assessment in the form of an article to SoSyM. Survey articles will still be reviewed according to high-quality standards, but do not need to contain a research experiment that has novel findings. Authors may also contact us before submission and provide a suggested topic area, list of authors, and a short argument that motivates the importance of the area surveyed. Other items that could be included in the correspondence are: why are the proposed authors the appropriate experts to serve as an authority to write such a survey, what comparison and evaluation criteria (e.g., epistemological, empirical, or any analytical form) will be used to categorize or distinguish the contributions made in the area. An outline, as well as an initial list of surveyed papers, tools, or approaches may be included in the correspondence. Relevance to significant areas of research or practice is high. The level of general interest is high. Software and Systems Modeling (SoSyM) is a quarterly international journal (published in English) that focuses on theoretical and practical issues pertaining to the development and application of software and system modeling languages and techniques. 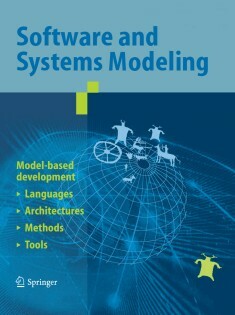 The aim of the journal is to publish high-quality works that further understanding of the theoretical underpinnings of modeling languages and techniques, present rigorous analyses of modeling experiences, and introduce scalable modeling techniques and processes that facilitate rigorous, efficient or economical development of software. The journal is unique in its emphasis on theoretical foundations of modeling languages and techniques, and on rigorous analyses of "real-world" modeling experiences. The balance of theoretical works and works based on in-depth analyses of experiences offers insights to researchers that can inform future investigations into better modeling languages and techniques, and provides modeling practitioners with a deeper understanding of modeling languages and techniques that can lead to more effective application. More information can be found at www.sosym.org, which contains recent editorials, as well as information about the submission process for different paper categories (such as regular survey/overview, and special themes). A complete list of all Reviewers, Special Section Editors, and Theme Issue Editors can be found here.